UCL Institute of Archaeology staff, students, friends and colleagues will be saddened to hear of the death of Alison Weisskopf on 11 January. Alison was a beloved colleague at the Institute of Archaeology, a fixture in the archaeobotany laboratory for many years, and a leading figure in archaeological phytolith research, respected globally. Alison joined the Institute as a BSc Archaeology (mature) student in 2000/01, demonstrating a strong affinity for environmental archaeology and archaeobotany from the beginnings of her studies. Her BSc dissertation on phytoliths 'A study of the phytoliths from the late Bronze Age site of Krasnoe Smarskoe, Samara Valley, Russia, and the information they provide on agro pastoral economies and environments', supervised by Arlene Rosen, was passed with distinction in 2003. In receipt of a AHRC scholarship, Alison continued her studies at the Institute, taking the MSc in Palaeoecology of Human societies, with a dissertation on 'An investigation of the Neolithic ash mound and settlement at Sanganakallu in the south Deccan, India, using phytoliths and macro-archaeobotanical material', receiving a distinction in 2005. Alison then began her PhD, again funded through an AHRC studentship. She submitted her PhD thesis, 'Vegetation, agriculture and social change in Neolithic north central China, a phytolith study', in 2009 and was awarded her doctorate in 2010, publishing a revised version as a monograph in 2014. In 2009 she took up a post-doctoral research associate position funded as part of a NERC project 'The Identification of Rice in Prehistory' (2009-2012), which came to be dubbed the Early Rice Project, and spawned follow-on research projects, including 'The Impact of Evolving of Rice Systems from China to Southeast Asia' (2013-2016), and 'The impact of intensification and de-intensification of Asian rice production: transitions between wet and dry ecologies' (2016-2019). During a intermission between the first and second NERC projects Alison secured funding through a British Academy small grant to explore comparisons between phytoliths and diatoms in rice paddy soils, and she received a travel grant from the Thai Ambassador to the UK for ethnobotanical fieldwork on non-rice plant use in Thailand. Her research, and her development of phytolith approaches to rice cultivation ecology, was central to these projects and their success. Despite being diagnosed with late stage cancer in 2010, Alison was at her most productive as a researcher over the past half dozen years, which is readily evident from her publications. She authored 27 academic papers or book chapters, with many more still in the pipeline. 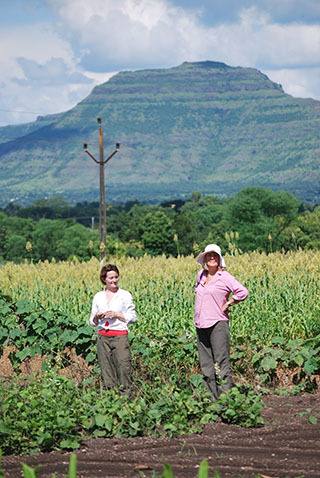 Her field research led her to far flung parts of Asia - from central China to Laos and the highlands of northern Thailand, through Bangladesh and Assam, remote parts of Odisha state in India, and the Western Ghats mountains along the western coast of India - to study modern rice ecologies, both cultivated and wild. Her unique experience and expertise meant that she attracted archaeological collaborations and samples for analysis from an even wider range of countries. Alison's research legacy is substantial. Her innovative approach to the reconstruction of rice cultivation ecology as well as crop processing can be expected to continue to inspire further research and agricultural ecology approaches to phytoliths around the world. She has made a lasting empirical contribution to archaeological research in China, Southeast Asia (Vietnam, Thailand, Cambodia), and South Asia (Bangladesh, Sri Lanka, India). Through ethnobotanical fieldwork (in India, Thailand, Laos) archaeological projects (in China, Bangladesh, Fiji), and many further collaborations, she was a key colleague in many international networks and leaves behind many friends around the world. Alison, herself, was a key node in the Institute community. Having worked in the archaeobotany lab as a post-graduate student and post-doctoral staff member for some 15 years, she was often the focus of discussions, both scientific and social. She trained and supported numerous students, offered countless cups of tea, words of encouragement, and a warm sense of humour and will be greatly missed. Our thoughts go out to her family at this difficult time.